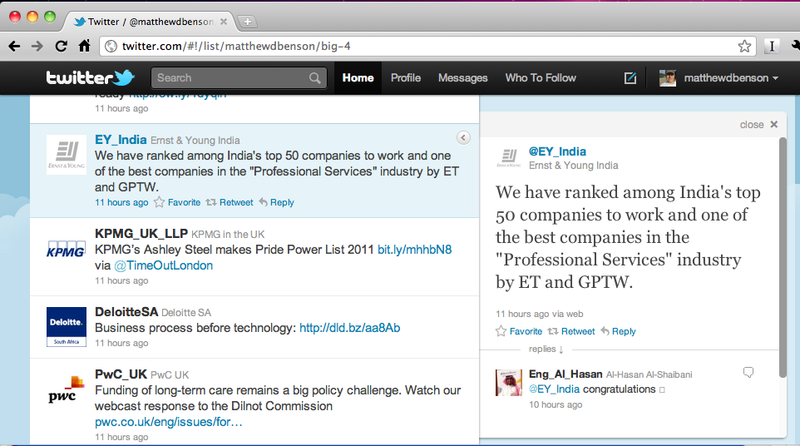 One could say that 2011 is the year that the ‘Big 4’ accounting / professional service firms (in alphabetical order: Deloitte, Ernst & Young, KPMG, and PwC) really ramped up their use of Twitter as a tool to communicate with people interested in what they might have to say. That is not to say that they didn’t already have Twitter accounts previously, but the number of Twitter accounts, and use of Twitter has increased significantly this year, including in many cases, separate accounts appearing for each country (often in local language). This growth however doesn’t always appear to be centrally managed, or connected to a clear strategy to using Social Media (rather appearing in some cases to be the result of decentralized, local decisions, indicated by inconsistent avatar graphic uses and unusual timing of appearance of new accounts). Below I comment on the types of accounts, what is being said, and provide links to Twitter lists where you can (with or without registering for Twitter) observe what the firms are saying.